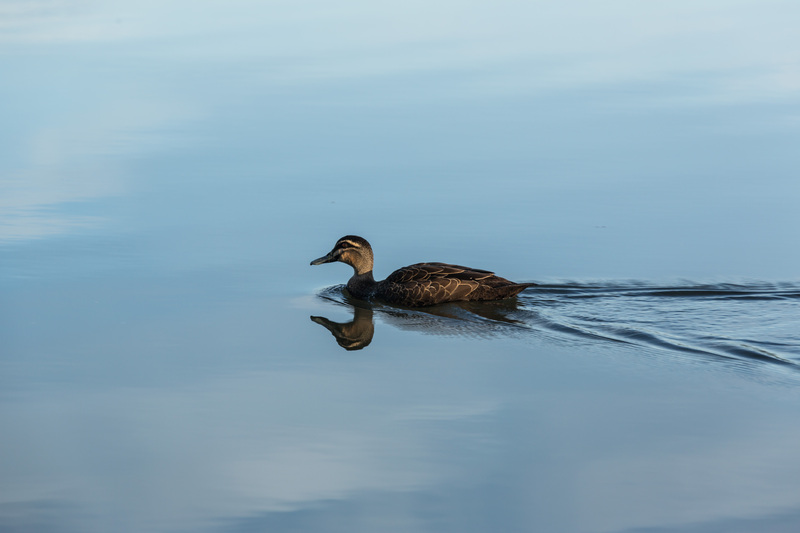 We had been planning this trip to Rutherglen in Victoria for quite some time as we were meeting up with an extended family group for a week of camping by the Murray River. 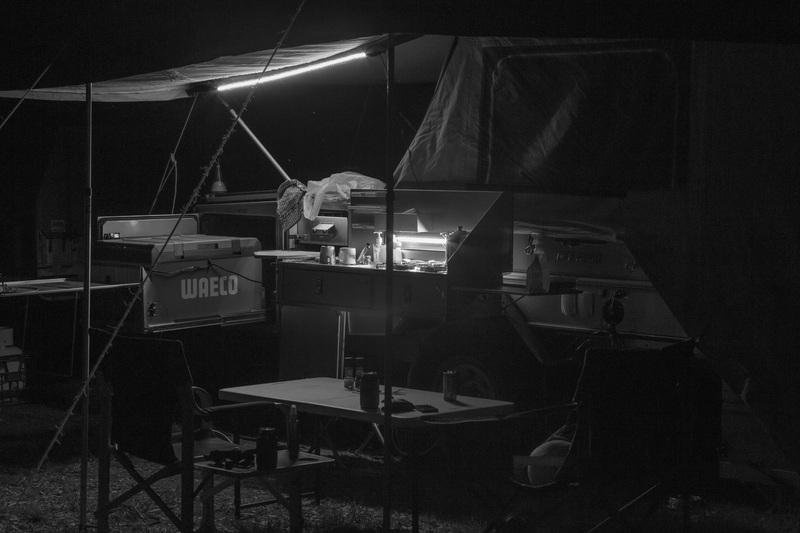 It was also the first real trip we had in our Aussie Swag camper trailer. 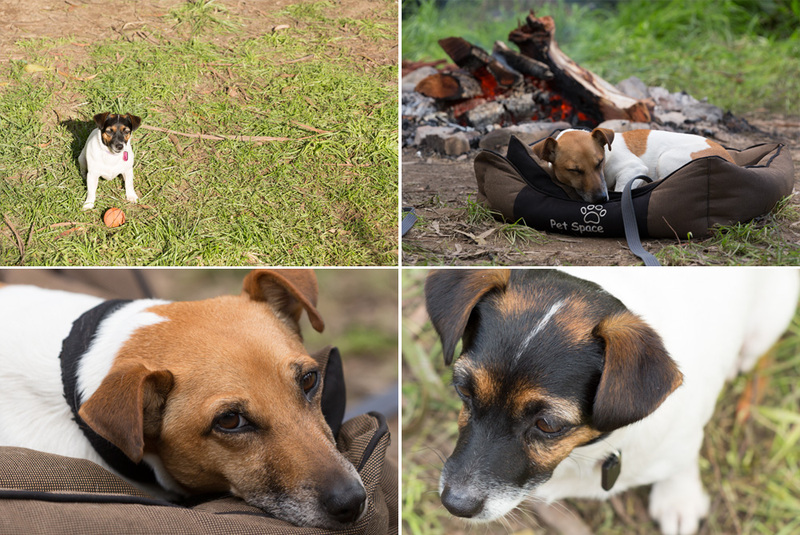 We also took two of our dogs – both the Jack Russell’s. 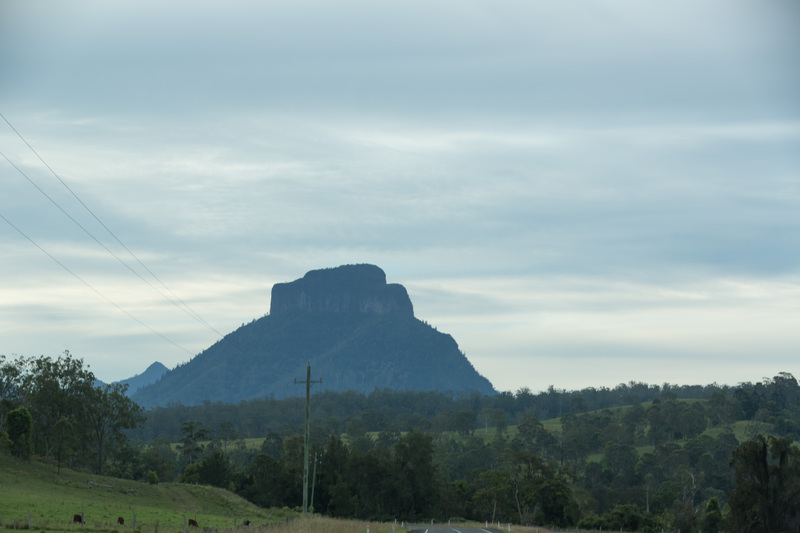 We left Canungra about 6:30 or so on the first morning with rain keeping us company (did that last time we left too). The goal for the first night was somewhere past Goondiwindi but we wanted to try out all sorts of different types of spots to assemble the Aussie Swag and so thought we’d aim for one of those truck stops by the side of the road. 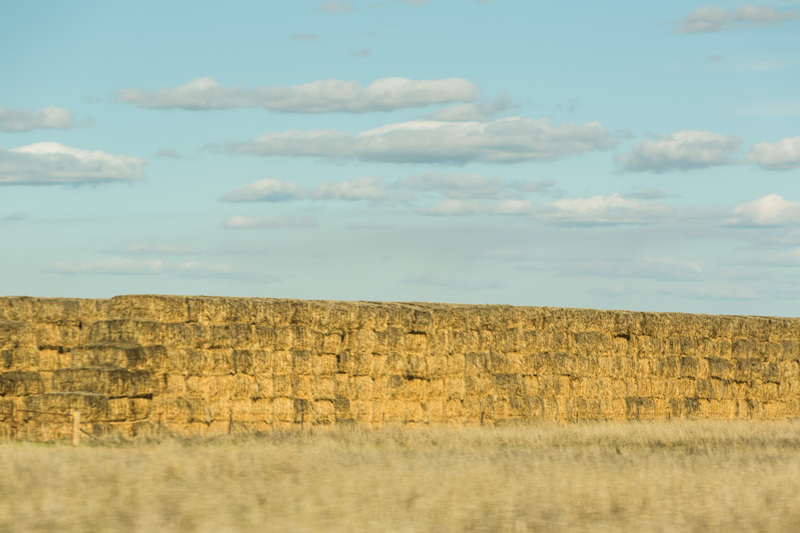 The drive to Goondi was fairly uneventful. That is, unless you count the fact that we stopped to help a turtle cross the road and take it back to some water. Whilst doing that, however, we did too tight a U-turn and, unbeknownst to us, we cut the cables to the brakes etc on the CT. We didn’t notice til we stopped at Canungra for a bite of lunch. The question then? Do we stay in Goondiwindi til Monday to have it fixed or do we push on. Neither of us fancied staying in Goondi for the weekend. Not because it’s not a nice place – it is! However, we were on a timeframe and we needed to get to Rutherglen to meet up with family. We weighed up the pros and cons and decided to push on. 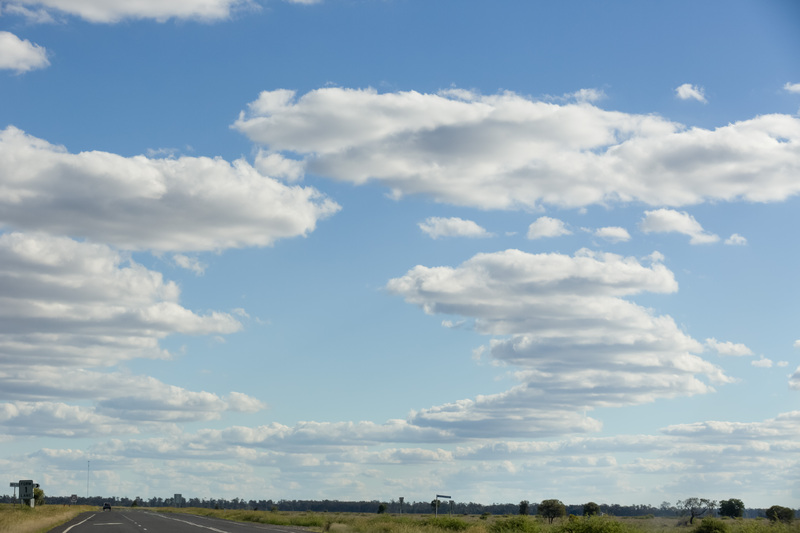 We knew the road was not going to be very busy – the Newell Highway is pretty lonely most of the time. We knew we didn’t really have any great hills or mountain ranges to cross and we also knew we would be in Forbes Sunday night and could get her fixed up there on the Monday morning. 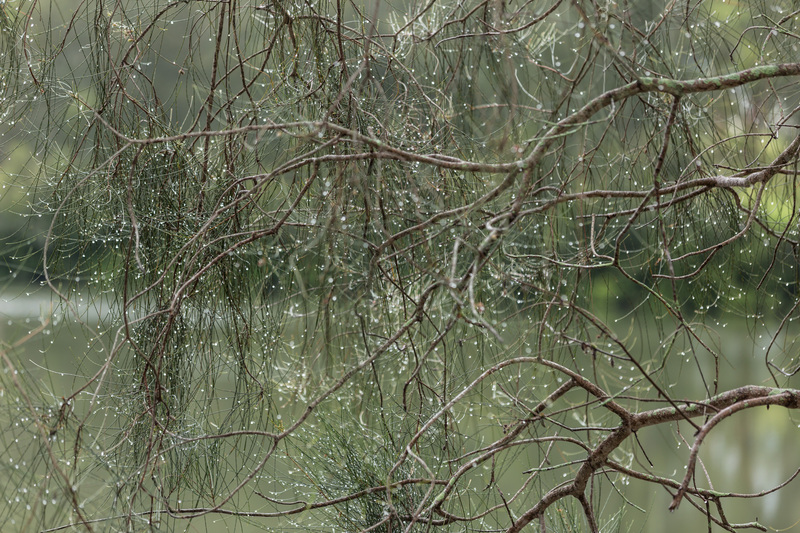 We pulled up for lunch in Goondi just across the bridge by the river – nice spot (except for the myriad of mosquitos…). We had our first real experience of opening up the kitchen and pulling out the camp chairs so that we could make our own lunch and a cuppa and enjoy a rest for an hour or so. The dogs both appreciated the rest as well. The whole experience was really quite easy and not time consuming. It was so enjoyable to be able to make our own cup of tea and sandwiches for lunch without it costing $20 from a take away store. (It was here that we discovered the cable cut). After our deliberations and discussions, we decided to head off on our merry way, keeping in mind the issues of the CT. Eventually we pulled up at a truck stop in a layaway by the side of the road somewhere around Narrabri. The CT set up quickly and easily and we were cooking dinner within about 15mins of stopping. Reflections on the night before: Probably won’t do that again. While the truck stop was easy to pull in to and it had a covered eating area for us as well as pit toilets, it was just too close to the road. This highway is heavily used by trucks and it was rather noisy. However, at a pinch, nothing wrong with it. Pack up took no time at all and we headed off to Forbes. 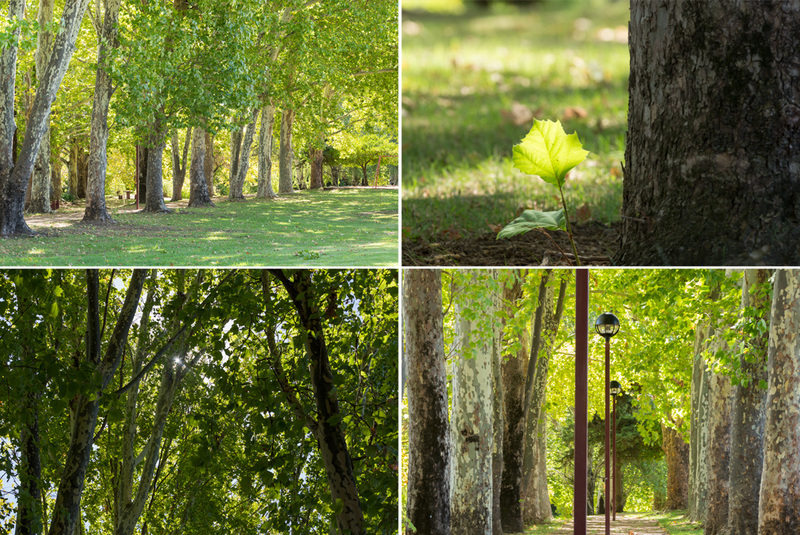 We decided to stop in at the park at Gilgandra and what a lovely spot it was. Morning tea and allowing the dogs to have a run around was just the thing to do. The locals were friendly – and by that I mean the ducks and geese which seem to have claimed the park and the road as their residence. 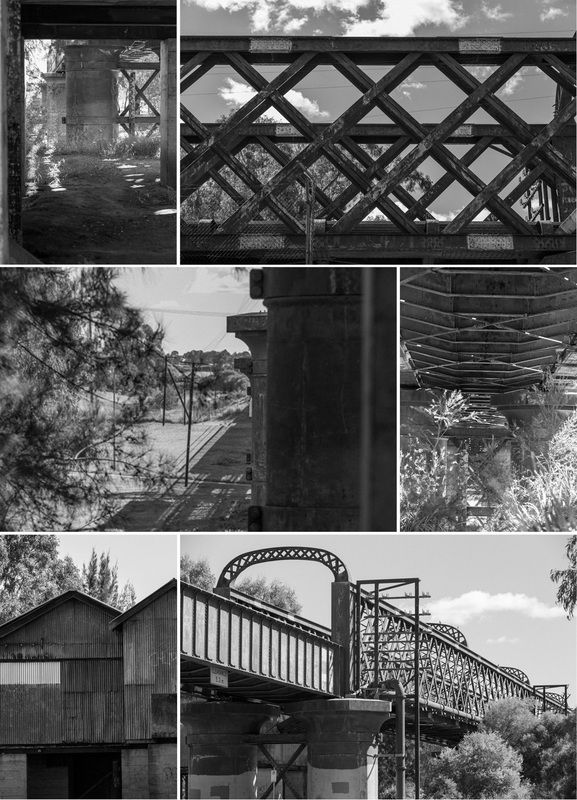 On the Castlereagh River, Gilgandra has a population of roughly 2700 people and apparently is considered the gateway to the Warrumbungles National Park. 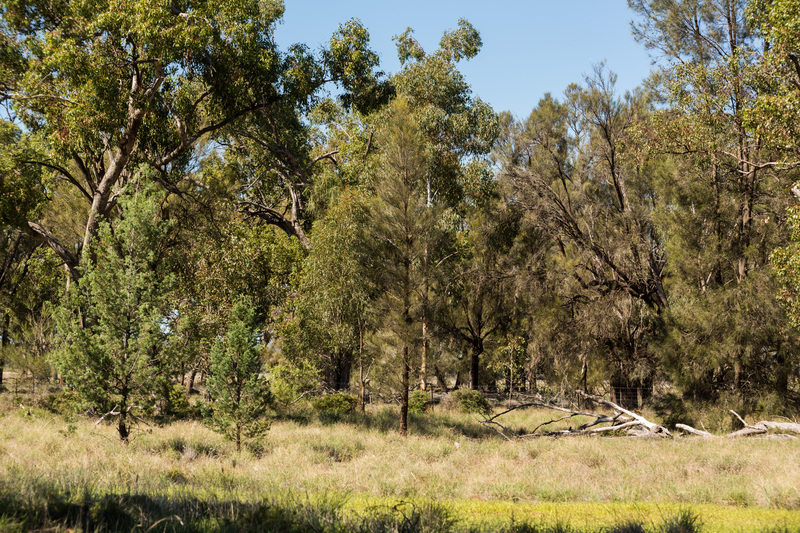 After a brief stop at Gilgandra, we headed off towards Forbes stopping in at Dubbo for lunch in the Biddybungie Reserve which is near the Tourist Information Centre. This is a lovely spot and one to which we have been several times before. I am, as always, fascinated by bridges and took the opportunity to photograph the through truss bridge near where we set up for lunch. This is the perfect stop to stop – there’s plenty of parking available for vans and camper trailers. It’s near a Coles Supermarket if you need to stock up. 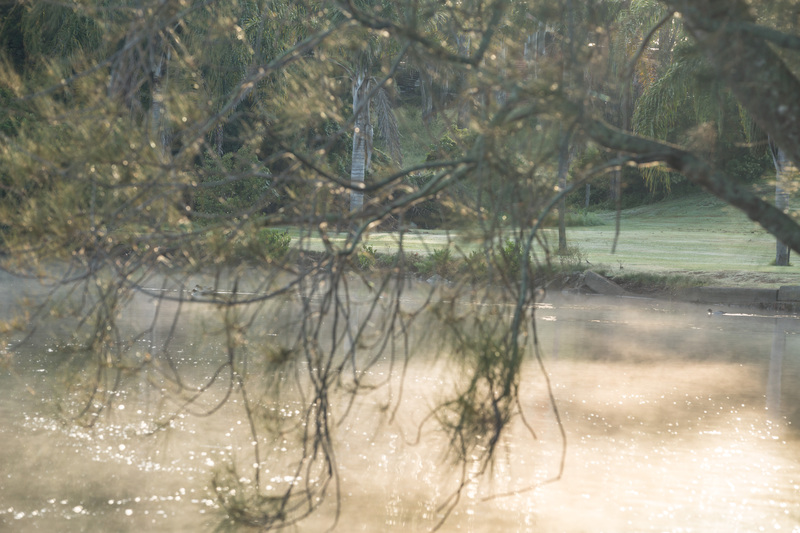 There’s loads of green space for you to let the kids and/or the dogs run around to let off some steam and it is on the Macquarie River. And so we headed off to Forbes where we had identified a free camp at the Rest Area (Camps 6 #953). Beautiful spot by the river. There are no toilets but it’s not much of a walk to the Day Camp area next door. There were quite a few vans parked there when we got there but there seems to be oodles of space. We had a lovely time and will probably plan to spend more than one night there next time. After a very peaceful night, we had to hang around til 8:30 when we would find an auto electrician open. Leisurely breakfast then we packed up. Drove to the nearest auto electrician who happily fixed our problem. Took a couple of hours, but we whiled away the time taking the dogs for a walk into Forbes and stocking up on some Easter eggs for the children (and some for me) for the upcoming Easter Sunday tradition. We really like Forbes, having been there quite a number of times before, and we really liked this free camp. Do yourself a favour and stop in next time. So, after picking up our CT from the auto electrician, we had to motor on our way so we could get to Rutherglen. 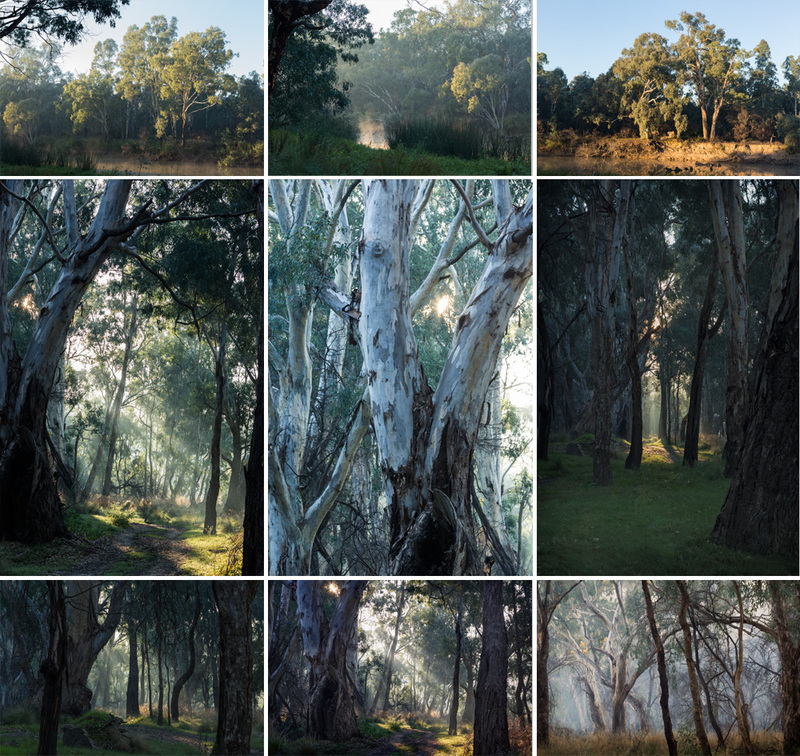 Here’s some images of ‘randomness’ on the journey so far. After an uneventful journey from Forbes, and with the brake cable now fixed, we headed to Rutherglen to meet up with family for the week. We had been looking forward to this for quite some time. We were going to be there before everyone else, except for one family, as the others arrived in dribs and drabs closer to Good Friday. 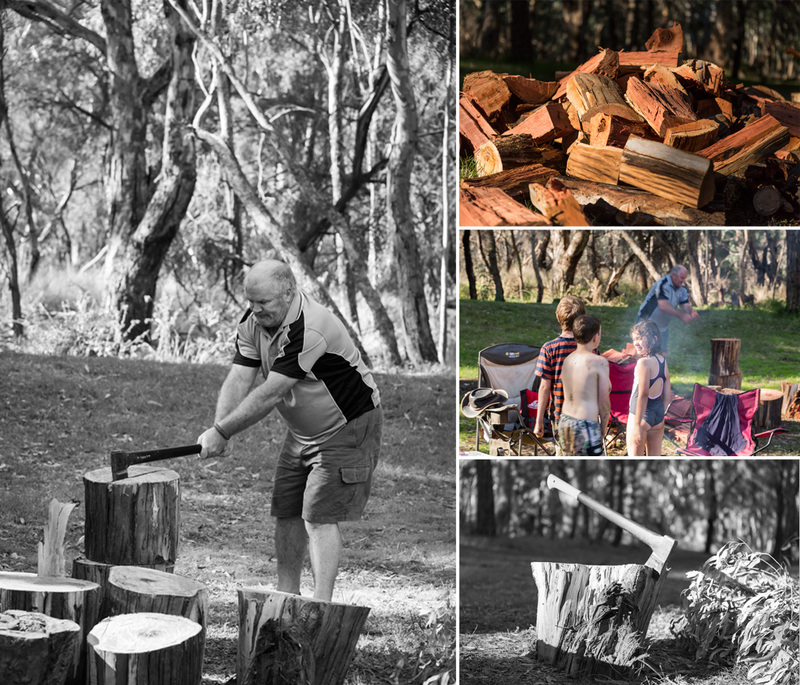 All in all, by the time we left, there were some 30 people there in an array of camping get ups – a caravan, mainly tents, our camper trailer…. What a joyous time we had. We met lots of new people. The campfire was on the whole time (it was rather chilly for that week) and everyone had a fabulous time. 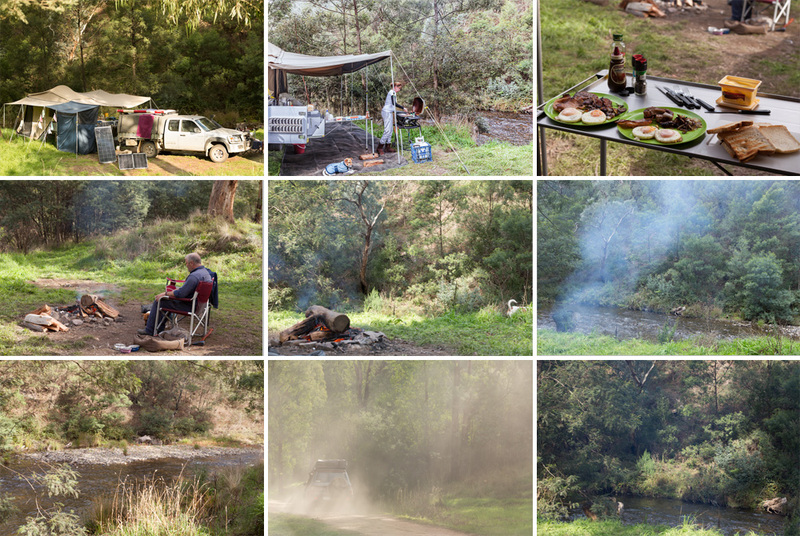 So, after a week at this glorious camp site, we headed off to Dargo in the High Country of Victoria. Excitement plus for me – I couldn’t wait to get back to the High Country. 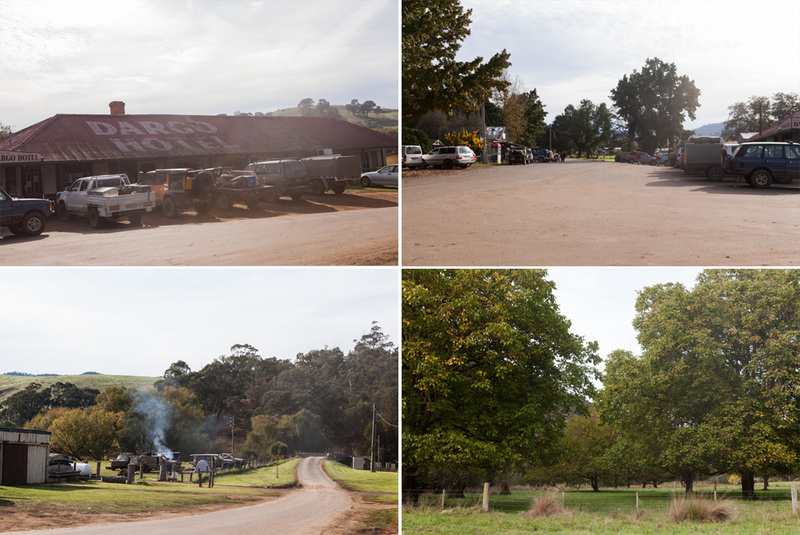 The last time we were there, we only stayed one night near Omeo so didn’t really get to experience it much. This time we had allowed 3 nights there – not nearly enough but enough to make me want to go back for more. 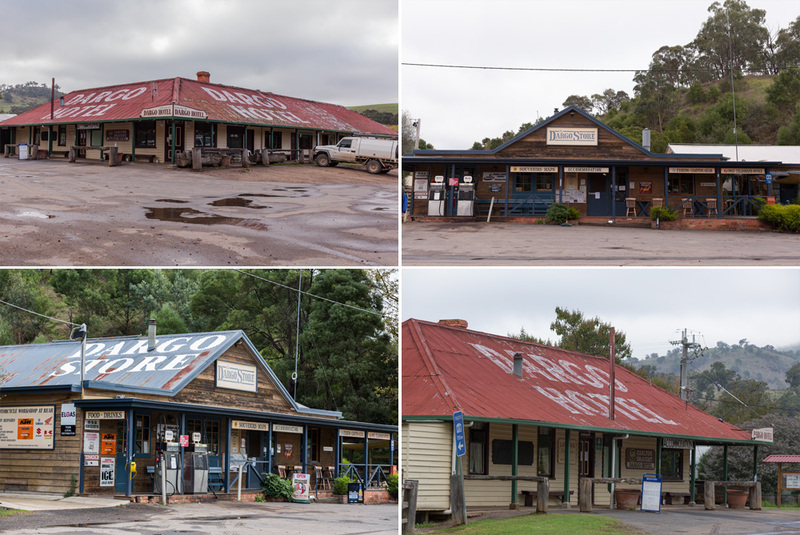 This time we went via Dargo, and it’s iconic hotel, to Italian Flats. There were absolutely loads of people milling around Dargo so we set off for our camp area – bearing in mind this is Easter Sunday. In hindsight, not a good day to bunk out of one camp and into another. Italian Flats was full but we managed to find a spot knowing that everyone would be gone the next day. We pulled in fairly late and it was cold – not chilly – COLD! 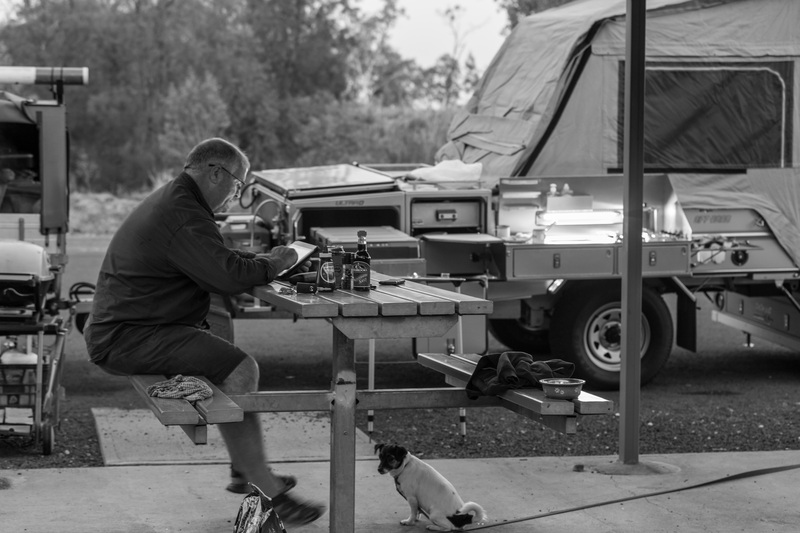 We started a fire, but it didn’t really do anything to heat things up, so after a quick dinner, the dogs and I retired to the warmth of the camper trailer. Damian stayed up but didn’t last much longer. The next morning, on his morning walk with Pepe, he discovered the best site of all so we packed up (sort of) and drove the 300m to the next stop. We didn’t even pack away CT fully – so we looked a little ridiculous driving that short distance with the awnings just tucked in on top of the CT – not locked down. Not recommended for any distance greater than 300m…. Damian had around the perfect spot right on the river with a little ledge making the site perfect for our CT and to veg out for a few days. For those reading this blog thinking they’ve seen some of these images before, you are not mistaken. You have! 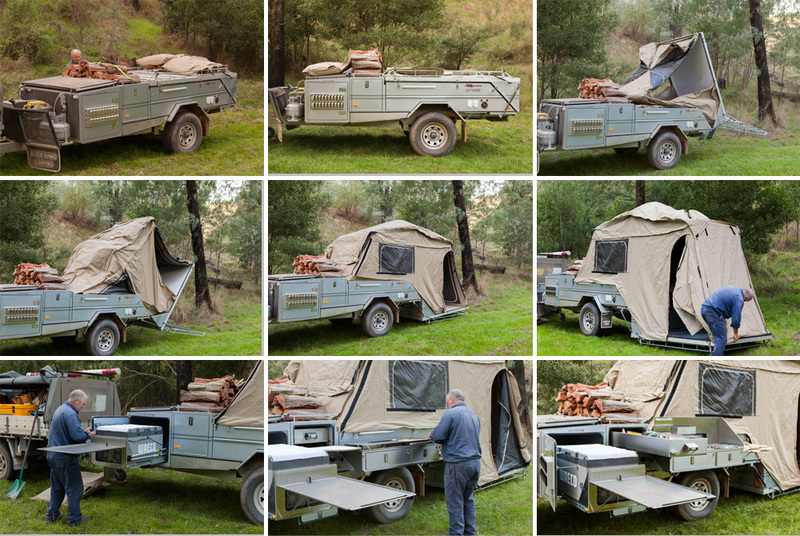 I had my first article published in the national magazine, Camper Trailer Australia in Issue #77 (June 2014) entitled ‘First Impressions of the Aussie Swag’. This spot was the best spot. We had no neighbours to speak of and our own little part of the river to call our own. Listening to the babbling of the river was so relaxing. The dogs adored the spot too. We decided to take a drive up to an area called Harrison’s Cut which was well worth it. A nice and easy 4WD track – all dirt but there was no rain to speak of that effected it so all good there. 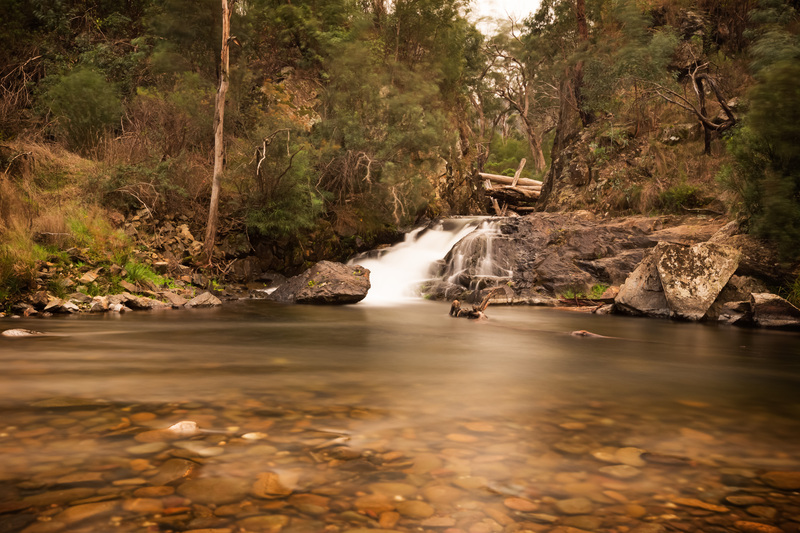 Harrisons Cut gold diversion sluice is located on the Dargo River approximately 15 km north of Dargo, Victoria, Australia. The 50 m cutting diverts a length of the river and allowed the exposed river bed to be sluiced for alluvial gold. No record has been found of Harrison’s Cut or any undertaking of its kind. Its position suggests a construction date in the 1880s. 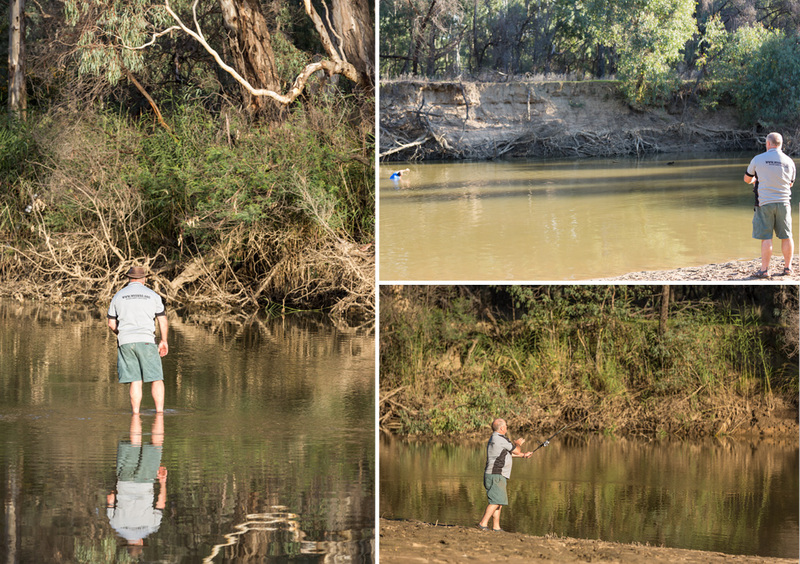 The cutting is one of around thirteen river diversions surviving from the Victorian gold rush. We drove around what used to be an entire town up there. You can see the plots where homes and hotels stood. There’s plaques everywhere advising what stood there. It’s quite an interesting drive. The next day, sadly we needed to depart Dargo and start heading home. ANZAC Day was almost upon us and we had promised to meet up with an ex serving member of Damian’s for the Dawn Parade in Taree. 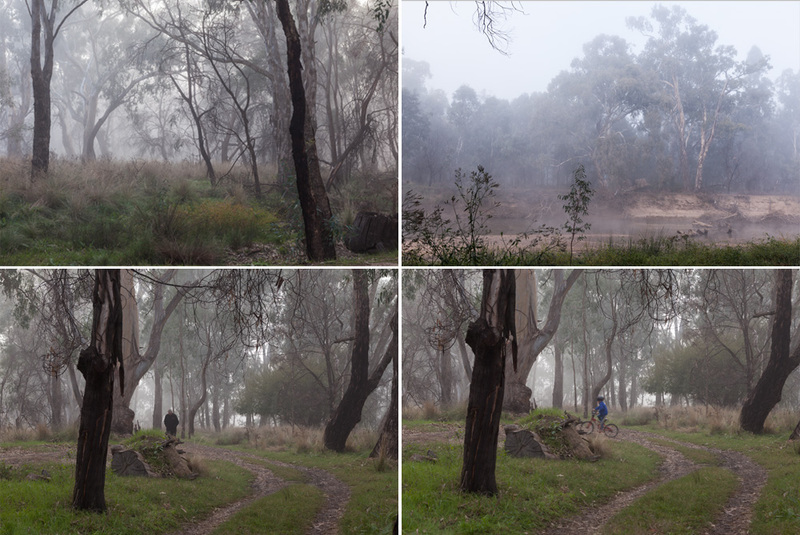 As we left Dargo, most of the tourists had left but we had experience rain overnight so things looked a little wet. 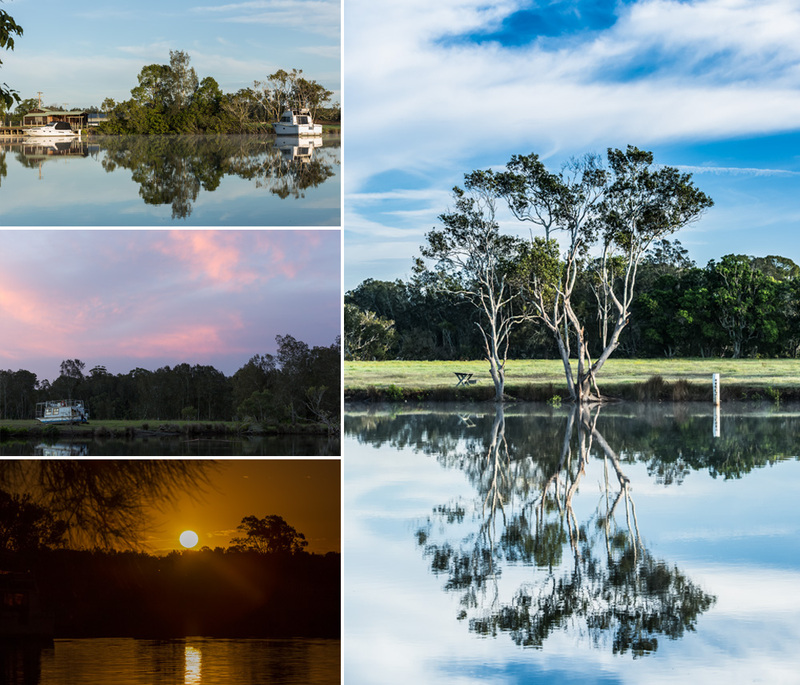 Another uneventful drive saw us arrive in Taree just as the sun was setting over the river. The bottom left hand image was the sight that greeted me as we pulled up. Needless to say, I left Damian set the CT up while I grabbed some quick images of this beautiful scene. While this site was a paid site, it was well worth it. 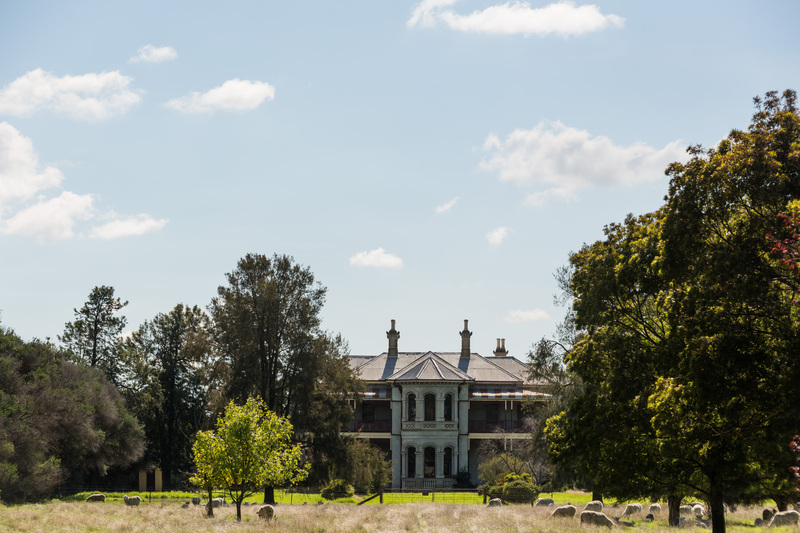 We could luxuriate in proper showers, wash my hair, iron a shirt for the Dawn Service and generally just relax in beautiful surroundings. We stayed at the Dawson River Tourist Park which is out of Taree just a little bit and next to the aerodrome. At the time of writing, River Powered Sites for 1 or 2 persons, were $33/night off peak and small dogs are allowed. 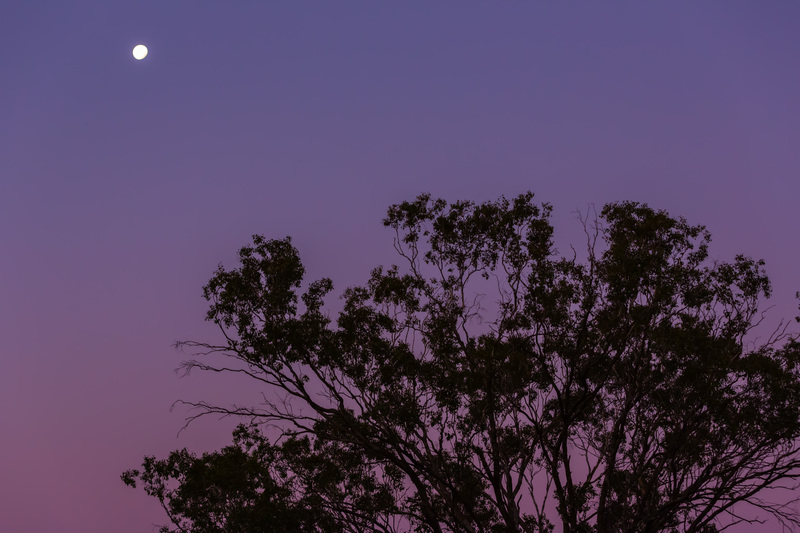 As we settled in for the night, preparing to wake early for the Dawn Service, the sky was calm and the night lovely and warm. I knew I should have paid attention to those signs. I got up during the night to head to the facilities, and noticed vast amounts of sheet lightning. Hmmm….in April. That’s unusual. Hearing thunder, I woke Damian and he did a perimeter check of the guy ropes etc. We settled back, thinking that there wouldn’t be much in it. That was the understatement of the holiday. At about 4am, the mother of all storms hit and we hunkered down, safe in the knowledge that our CT was very safe and very waterproof – which it was. 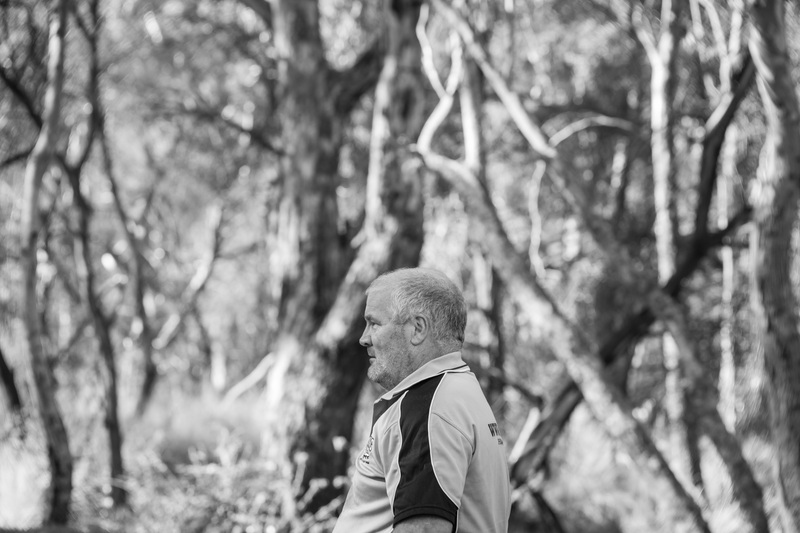 ANZAC Day dawned and for the first time ever, Damian missed a dawn service. The storms had abated but he felt he needed to be where the camp site was to look after things in case of emergency. As it was, the Dawn Service was held in a local undercover car park. The storms had cleared by the 9am service, though it was damp, cold and miserable. Damian headed off to meet his mate for that service while I stayed home and tidied up a bit. I didn’t want to take the dogs to that service – too many people for them. After a long ANZAC Day, it was early to bed for us knowing we had to head off the next day. We loved our time at this Tourist Park, and will certainly look to stay here again, though only for one night, as it is a little expensive. We decided we needed to find a car wash so that we could wash the underbelly of the CT after being up in High Country. We located one on the way out of Taree and spent an hour or more there cleaning ‘Matilda’ up (yes, I’ve named the CT). Then it was homeward bound. We are planning to join the Camper Trailers Org National Meet at Glen Innes in September but until then, there won’t be any opportunities to go camping again I’m afraid. Are you enjoying my blog? Are you going to the Glen Innes meet? PS: For those who have missed it previously, here is a sequence of images showing the ease of set up of the Aussie Swag.